We’re under starter’s order to provide readers with insightful tips on the biggest meetings in the horse racing calendar. Whether it’s the flat or the jumps that take your fancy, BetStars will have odds on the meetings you love like Royal Ascot, Cheltenham, Aintree and York, examining the runners and riders from the Epsom Derby, Cheltenham Gold Cup and Grand National, plus lots more. When it comes to horse race betting, we’re at the winning post! We've taken a look at the 2019 Grand National odds and have picked out six of the best prospects to prevail at Aintree for punters to consider. 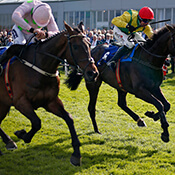 Whether you take a regular interest in horse racing betting or just like an occasional flutter, everyone loves to have a punt on the Liverpool spectacular, BetStars is the place to be for Grand National betting online so check out our website for all the Grand National latest odds.